SQM is strongly committed to sustainable development. Consequently, the Company carries out its operations in harmony with the environment, ensuring that natural resources and inputs are used in a sustainable manner and minimizing the possible impacts of our production processes. We have developed solid know-how of the ecosystems surrounding our operations, which enables us to implement the prevention, mitigation, monitoring and control plans necessary to ensure that these environments are protected. We work relentlessly to continually improve all our processes and operations. The Company has a strict Environmental Management System (EMS) aligned with its core values, which is used to safeguard the natural environment and communities near its operations. The system, which addresses the environmental and social aspects of all new investments, is applied starting from the design stage of any new project. The EMS also incorporates important aspects such as protection of environmentally sensitive areas, compliance with applicable laws, safeguarding of archaeological and cultural heritage, and limited impact on the lifestyles, customs and traditions of neighboring communities, along with other environmental variables. SQM has conducted environmental assessments for all new projects or major modifications to existing ones. Over 57 projects have been assessed and approved since the enactment of the Environmental Framework Law No. 19,300 in 1994. The main raw materials used by SQM are caliche ore and brines, which are extracted from reserves in the Tarapacá and Antofagasta regions. Caliche is a mineral that exists almost exclusively in Chile. In fact, the country boasts the most important commercially exploitable reserves in the world. This mineral has high concentrations of sodium nitrate and iodine and is found beneath inert material no more than two meters below the desert’s surface, in layers two to three meters thick. The underground salt brines found in the Salar de Atacama have high concentrations of lithium and potassium. The main products obtained from this resource are potassium chloride, lithium carbonate, lithium hydroxide, potassium sulfate and boric acid. These two resources complement each other to create one of the Company’s most important products: potassium nitrate. 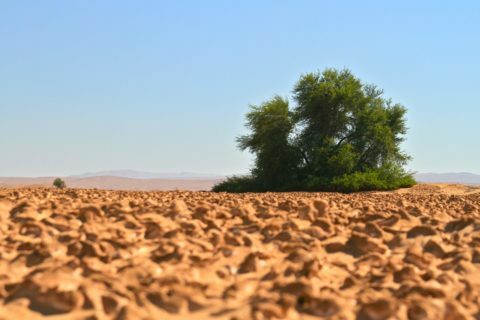 Since the Company operates in the Atacama Desert and water is an indispensable resource in its production processes, it must be used rationally. Accordingly, SQM abides by applicable regulations in using all water rights held by the Company, as mandated by its Sustainable Development Policy. SQM regularly informs authorities of the water consumption in its production processes and considers new ways of more efficiently utilizing water by evaluating each facility’s water management indicators on a yearly basis. The measures implemented include reincorporating all water treated in SQM sewage treatment plants into its production processes. Water extracted for production undergoes a thorough prior analysis to prevent damage to important environmental variables (e.g. vegetation, flora and fauna) in aquifers and surface water sources where the Company has water rights. In order to responsibly manage solid and liquid hazardous and non-hazardous waste, all SQM facilities have specially equipped, approved storage and disposal sites for hazardous and non-hazardous industrial waste as well as temporary storage sites. The Company applies authorized hazardous waste management plans at all of its facilities. Each of these plans requires the use of authorized transport and recipients to treat and dispose of all types of waste. Compliance with these plans is verified using ongoing internal environmental audits, which are intended to guarantee proper waste handling from generation to final disposal. More than 50% of hazardous waste generated by the Company is reutilized by an external company that uses it as alternative fuel. Employees play a key role in properly handling and classifying waste, which is why the Company makes a considerable effort to train them how to classify and segregate waste, and how to properly dispose of waste in designated facilities provided by the Company to ensure hazardous waste is appropriately managed. Domestic liquid waste from the Company’s industrial and camp accommodation facilities is treated at authorized water treatment plants near each facility. Effluents emitted from these plants comply with applicable regulations and are reutilized in production processes. Domestic liquid waste from our offices in Antofagasta and Tocopilla is disposed of in the public sewer system and, therefore, no dumping occurs. The treatment plants are maintained and monitored by specialized service providers. The Company uses management programs and authorized disposal sites at our facilities and camp accommodations for solid domestic waste or contracts out services to dispose of this waste in authorized landfills. SQM’s production facilities are located in areas that do not present significant biodiversity because of their geographic and climatic conditions. However, some of its areas of influence are valued for their biodiversity, which has led the Company to implement protection and mitigation plans within each of them. One example is the Company’s operations in the Salar de Atacama. Although its property is located dozens of kilometers from the Soncor and Aguas de Quelana sectors of the National Flamingo Reserve, both areas are protected by environmental monitoring and contingency plans implemented by SQM for proper safeguarding. In the case of the Nueva Victoria operations, the Salar de Llamara is home to a native tamarugo (Prosopis tamarugo) forest and, therefore, is classified as a priority site for conserving biodiversity in the Regional Biodiversity Conservation Strategy for the Tarapacá Region. In this spirit, SQM participated in a working group led by the Tarapacá Regional Environmental Authority (Seremi de Medio Ambiente) to design a Priority Site Conservation Management Plan for the Salar de Llamara and conduct extensive environmental monitoring on the level and quality of nearby groundwater; the water level, water quality and aquatic biota in Puquios de Llamara; and the flora and fauna in that area. The Company’s production activities near these areas have undergone extensive environmental assessment processes. These assessments include an evaluation stage for all activities with potential environmental impacts, after which all protective measures necessary to minimize any potential effects are taken. SQM implements thorough and robust environmental monitoring and control plans in these sectors in order to ensure that its operations are carried out in compliance with predefined environmental objectives and that decisions are made promptly in cases where deviations are identified between monitoring results and commitments made by the Company. These plans address matters such as vegetation, flora, fauna and aquatic biota, among others, and are complemented by programs to monitor responsible water management and the hydrology of the aquifers from where we extract both industrial water (Salar de Atacama, Salar de Llamara and Salar de Sur Viejo) and the raw material for its processes, such as the brine deposits in the Salar de Atacama. As part of the commitments undertaken by the Company in the project “Changes and Improvements to Mining Operations in the Salar de Atacama,” SQM carries out an environmental monitoring plan to evaluate the status of the systems in the Salar de Atacama. This includes an ongoing hydro-geological monitoring plan and biotic monitoring conducted annually in April, when vegetation is most vigorous following summer rains in the area. The Company monitors a set of variables that allows it to detect changes in lake systems and vegetation in a timely manner using direct, on-site measurements and also high-resolution satellite images (QuickBird or WorldView 2). This monitoring includes variables such as flora and fauna, vegetation, soil moisture content and aquatic biota in three lake systems within the Salar de Atacama: Soncor, Aguas de Quelena and Peine. The Company also has 225 aquifer monitoring points in the Salar de Atacama for hydro-geological monitoring, which includes measuring the levels and physical and chemical qualities of water distributed among shallow and deep wells, metric rods at lagoon level and gauging stations; meteorological stations and lake surface monitoring using satellite imaging. Hydro-geological monitoring is a quantitative tool used to verify forecasted impacts during a project’s operations. It also serves as an instrument for operating the Contingency Plan. In addition to the environmental monitoring plan, we signed a cooperative agreement with the National Forestry Corporation (CONAF) in 1995. 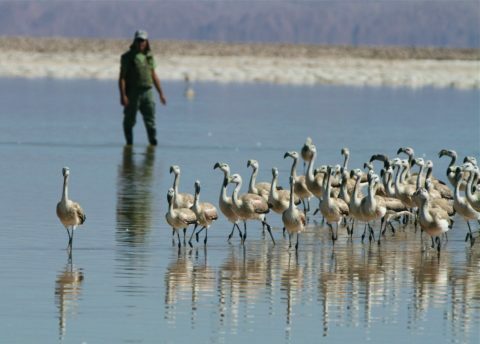 This agreement includes an environmental monitoring program entitled “Bird Life Habitat and Population in the Salar de Atacama,” which is aimed at opportunely detecting changes in the lake’s surface and depth, the bird population, flamingo food supply, local physical and chemical conditions and human activities. This monitoring is complementary to the hydro-geological and biotic monitoring carried out by SQM as part of its environmental monitoring plan. The Salar de Llamara is home to a native tamarugo (Prosopis tamarugo) forest and springs known as “puquíos” with stromatolites and, therefore, is classified as a priority site in the Regional Biodiversity Conservation Strategy for the Tarapacá Region. As part of the Pampa Hermosa project, SQM carries out an environmental monitoring plan to observe a series of environmental variables in order to ensure that the project’s activities adhere to the provisions of the environmental assessment. The Company monitors tamarugo vitality using high-resolution satellite images taken each year in November, when there is the greatest amount of vegetation. Our efforts in this area also include repair and compensation measures such as irrigation, plant production, tamarugo planting, phytosanitary programs and off-site conservation of tamarugo germplasm. We also conduct semi-annual monitoring of underwater and surface biota (water quality) in the lagoons in the Salar de Llamara in order to verify that there are no unforeseen effects on biotic systems. A mitigation measure has been implemented to reduce the effects of the decline in the water table on the Puquios de Llamara. Maintaining the levels and chemical quality of the water with minimal variations facilitates adequate development of biotic systems. The Company also has a Hydrological Monitoring Plan used to verify forecasts of project impacts, which is a key component of its Early Warning Plan. This plan involves monthly measurements of aquifers and of the volume and flow of water extracted from authorized wells. Located at kilometer 1787 along the Pan American Highway in the district of Pozo Almonte, the Pampa del Tamarugal Center for Environmental Education (CEDAM) is an innovative, collaborative project involving SQM and the National Forestry Corporation (CONAF). These two organizations see this center as a contribution to sustainable development, environmental education and heritage appreciation in the Tarapacá Region. CEDAM places special emphasis on the native tamarugo tree, its ecosystem and its historical and present-day importance in the Tarapacá Region. This center, which is one component of SQM’s Tamarugo Environmental Management Plan for the Pampa del Tamarugal National Reserve, aims to teach visitors to conserve and appreciate the tamarugo tree’s ecosystem, while conveying the virtues of the pampa. Visitors can also tour the “Alejandro Caipa” greenhouse and walk along the “Los Tamarugos” path, which provides a unique opportunity to learn about the importance of the native tamarugo tree, the national reserve and Pampa del Tamarugal, which was classified as a protected area in 1983. • Monitoring of tamarugo tree vitality, Salar de Llamara. • Monitoring of water quality and aquatic biota, Salar de Llamara. For SQM, building and maintaining good neighbor relations with the towns surrounding our operations is very important. Over the long term, these efforts have allowed for new and better opportunities for the inhabitants of nearby communities as well as for the Company. Community ties are built on a foundation of transparency, respect and mutual trust, and are evidenced by interactions with neighbors while developing community programs. The Company also actively publicizes its projects in the community in order to keep neighbors informed and gather feedback and concerns. These efforts have enabled the Company to build bonds of trust with local residents. • Historical heritage: commitment to preserving and disseminating the legacy and heritage of the nitrates industry. • Education and culture: new and better growth and development opportunities for communities and their people. • Social development: corporate social responsibility related to the economic and social development of communities. This line of work is related to SQM’s origins and is a reflection of the Company’s commitment to preserving and disseminating the legacy and heritage of the nitrates industry. Some of its most important initiatives include SQM’s involvement in the Nitrates Museum Foundation and the Chacabuco Foundation, working collaboratively to preserve and revive the legacy of nitrate production in the Tarapacá and Antofagasta regions. The Company also supports the Huanchaca Ruins Foundation. Its contributions to these institutions cover a portion of their operating expenses and provide support for research, conservation and restoration projects, such as opening the former Chacabuco nitrates office for public viewing. SQM is also committed to preserving and adding value to María Elena, developing a restoration and beautification program for heritage elements in this nitrates town. SQM prepares thorough records of pre-Hispanic and historical remains found near mining areas as part of the environmental studies conducted prior to the launch of new projects and implements preventative measures to protect them, especially near María Elena, Nueva Victoria and Pampa Blanca. The Company also develops several initiatives to preserve both tangible and intangible nitrate industry heritage. Highlights include its support of events organized by the Hijos del Salitre Foundation in the Tarapacá Region, including “Nitrates Week,” a series of events such as poetry readings, musical performances and pampa food sampling, literary workshops and group tours to the Santiago Humberstone and Santa Laura nitrates offices. SQM also provides support for pampa residents to make a pilgrimage on November 1st to nitrate office cemeteries to remember their deceased relatives. At last year’s pilgrimage, participants also adorned the grave sites with hundreds of tin flower wreaths crafted in Company-sponsored workshops to revive traditions. Over the past few years, our Company has continued its efforts to provide new and better opportunities for growth and development to children, young people and adults from different towns in the regions of Tarapacá and Antofagasta. Through support for the implementation of training courses and programs, SQM looks to strengthen the talents and skills of participants so that they can better meet their educational and professional challenges. We have renewed our commitment to education with the firm belief that education plays an important role in the country’s development as the main route to social wellbeing. Such initiatives include funding for the Crea+ Mathematics Program, which has been implemented in schools in San Pedro de Atacama and will soon be expanded to include the towns of María Elena and Pozo Almonte, benefiting 211 students and 13 teachers in 2012. Similarly, for the fifth consecutive year, the Company has provided financial support for psychopedagogical programs to strengthen student learning processes in the community of San Pedro de Atacama, as well as workshops and recreational activities in the Toconao school, in collaboration with nuns from the Patmos convent in that town. One of the cornerstones of SQM’s corporate social responsibility efforts is tied to the economic and social development of the communities near its operations. The “Atacama Tierra Fértil” agricultural program in the district of San Pedro de Atacama and the town of Quillagua (Maria Elena) is also designed to support the community by developing sustainable agricultural products with greater added value. In the district of Pozo Almonte, SQM works with the National Institute for Agricultural Development (INDAP), the Municipality of Pozo Almonte and the mining company Teck Quebrada Blanca to develop the “Agricultural and Commercial Improvements for the Farmers of Pintados” program. This initiative is focused on strengthening the local agricultural sector and helping families increase their household income by identifying business opportunities for their agricultural products. Another interesting project is the Ayllu Wine Project being developed in Toconao. Here, a multidisciplinary team from SQM has partnered with local farmers to produce high-altitude wine from grapes grown at more than 2,400 meters above sea level. The participating farmers have acquired crop management and wine making techniques, which has resulted in attaining important production goals.